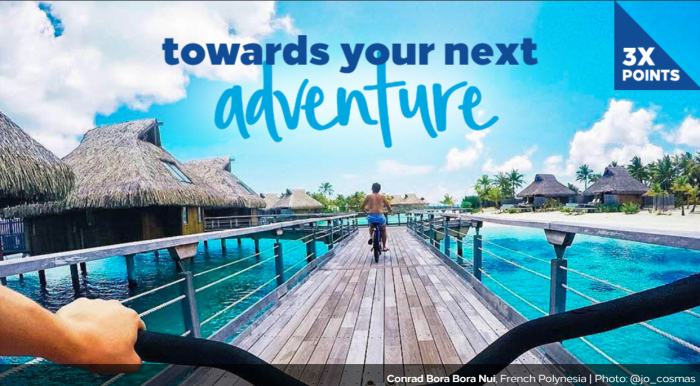 Hilton Honors has launched their next promotion that is called Moments Made Bigger and is valid for stays September 10 – January 3, 2019. Members earn triple points for stays at Waldorf Astoria, Conrad and Resort hotels and double points everywhere else. There are currently 243 (access here) Waldorf Astoria, Conrad and resort hotels under Curio, DoubleTree, Embassy Suites and Hilton brands where members can earn triple points during this promotion. Surprised that Hilton Honors this time didn’t run a offer for flat number of bonus points that they tend to have ever once in a while. The triple points offer for Waldorf Astoria, Conrad and Resorts is a nice and double points is good too. Remember that you can earn 2,500 bonus Lufthansa Miles&More miles in addition to these points for each stay through October 31, 2018. You can read more about this offer here, here and here. Offer valid for stays completed September 10, 2018, through January 3, 2019 (“Promotion Period”) at any hotel or resort within the Hilton Portfolio excluding Hampton by Hilton Hotels in Mainland China. Hilton Honors™ members must first register at HiltonHonors.com/MomentsMadeBigger prior to completing a stay within the Promotion Period. Registered Hilton Honors members will only receive Bonus Points for nights completed during the Promotion Period, regardless of a check-in date before the Promotion Period begins or a check-out date after the Promotion Period ends. Registered Hilton Honors members will earn double points per stay on all non-luxury and non-resort properties and will earn triple points per stay at any luxury or resort property during the promotion period. Waldorf Astoria® Hotels and Resorts and Conrad® Hotels and Resorts are considered luxury properties. See here for a full list of luxury and resort properties that qualify for the Triple Points promotion. Members can also book resort properties directly through Hilton.com. There is no limit to the total amount of Bonus Points that may be earned during the Promotion Period with this offer. However, there are restrictions on the amount of Base Points that can be earned on a single stay at certain brands. Registered Hilton Honors members will earn Double Points per stay at non-luxury and non-resort properties and Triple Points per stay at luxury or resort properties during the promotion period. There is no limit to the total amount of Bonus Points that may be earned during the Promotion Period with this offer. At which properties will I earn Triple Points for my stays? Waldorf Astoria® Hotels and Resorts and Conrad® Hotels and Resorts are considered luxury properties; additionally, multiple brands within the Hilton portfolio have eligible resort locations. See here for a full list of luxury and resort properties that qualify for the Triple Points promotion. You can also book resort properties directly through Hilton.com. What is the Promotion Period for the “Moments Made Bigger” Hilton Honors promotion? How is the earn rate calculated? Does my incremental spend on things like room service count towards my Bonus Points? Yes. Additional spend on room service or other services charged to the room will count towards earning Bonus Points; however, additional spend on services at Hampton by Hilton™, Tru by Hilton™, Homewood Suites by Hilton®, and Home2 Suites by Hilton® will not count towards earning Bonus Points. Yes. Hilton Honors members must register for the promotion at HiltonHonors.com/MomentsMadeBigger. You can join the Hilton Honors program for free, register for the promotion and immediately be eligible to participate. Simply visit HiltonHonors.com/MomentsMadeBigger and follow the steps to join Hilton Honors and register for the promotion simultaneously. To make sure everyone has the most up-to-date Terms and Conditions, we have posted them on the website HiltonHonors.com/MomentsMadeBigger. If I check-in before September 10, 2018, or check-out after January 3, 2019, do I still earn credit for that stay? Will I receive Bonus Points with the “Moments Made Bigger” promotion for any stays within the Promotion Period that I completed PRIOR to registering for the promotion? No. Only members registered prior to check-out will receive Bonus Points with the “Moments Made Bigger” promotion for nights within the Promotion Period. Will I earn Bonus Points for Reward Stays with the “Moments Made Bigger” promotion? Members will earn Bonus Points with the “Moments Made Bigger” promotion if they have incidental charges during a Reward Stay, provided such charges are deemed eligible folio charges. This does not apply to incidental charges for stays at Hampton by Hilton™, Tru by Hilton™, Homewood Suites by Hilton®, and Home2 Suites by Hilton®. For a complete explanation, see number 14 under Accrual of Points here. If you have more questions about the “Moments Made Bigger” promotion, please feel free to contact us at 800-548-8690. Outside the United States and Canada, please dial + 800 44 45 86 67.